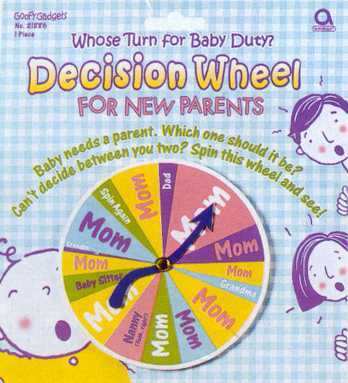 A variety of decision wheels! 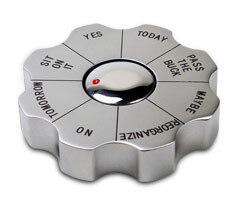 There are several different decision wheels available, some are used in business and some are used tongue-in-cheek! This particular one is used to decide who should get out of bed during the night to see to a crying child. And this one adds a bit of flair because you spin this dart board before throwing a dart at it. Goodbye indecision! 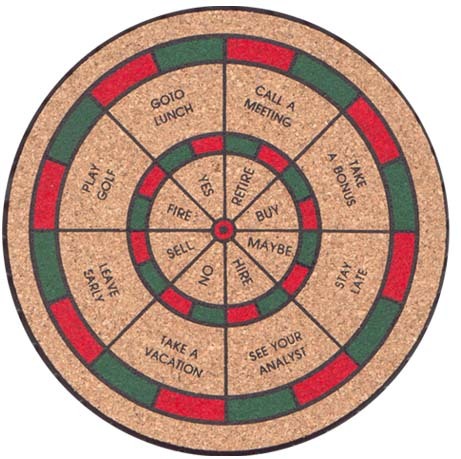 Some business decision making processes are represented in the shape of a wheel. The idea is to make a decision, and then action is implemented. The results of the action are assessed. If the organization is moving in the right direction the next decision is made. If not, the first decision is revised or remade. Then action taken, results assessed, and further decisions, forming loops or decision wheels. The idea obviously behind constantly checking the decisions it to ensure that the organization stays on track. And as long as it makes more right decisions than wrong decisions, and the wrong ones are quickly corrected, progress is assured. The aim is to more and more select decisions that are aligned with the company's values and vision in order to continue the cycle of the wheel.